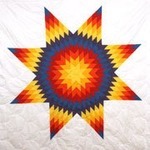 I'm looking for information about the father of the Osage leader known as Wah-She-Hah (aka Star That Travels, aka Wah-Tze-Noh-In, aka Fat Of The Skin, aka Bacon Rind). Chief Bacon Rind, was born sometime in 1860 and died on 28 March 1932. Any help would be appreciated. Star That Travels was born on January 1, 1860 . He was the son of Okepasah, an Osage subchief. His mothers name was Warahumpah. Most histories say Bacon Rind was born in 1860, but others say 1853 or 1854. I have a copy of his May 13, 1926 wedding announcement to his second wife (a Kaw Indian & sister to Forrest Chouteau) and it gives his age as 72. The following piece (linked below) says he was born in 1853. 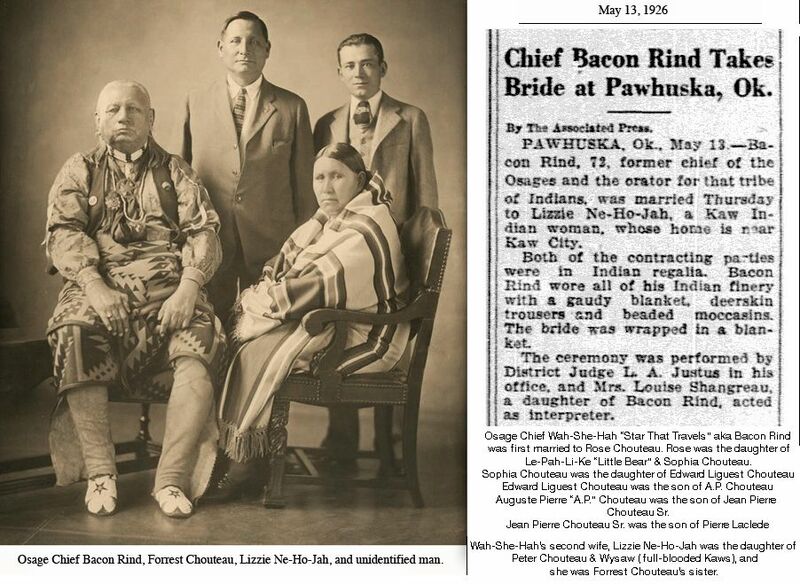 Bacon Rind's May 13th, 1926 wedding announcement to Lizzie Ne-Ho-Jah says "The ceremony was performed by District Judge L.A. Justus in his office, and Mrs. Louise (spelling error?) Shangreau, a daughter of Bacon Rind, acted as interpreter." It is the name Shangreau that has me puzzled. I'm familiar with the Shangreau-Sioux connection, but I'm ccurrious about this Osage connection. Are the Osage and Sioux Shangreau families related? There was a film-maker named Lily E. Shangreaux who was born on the Pine Ridge Reservation and she might have an Osage connection (but I'm not sure about that). She was co-producer/writer for The Great American Foot Race (aired on PBS IN 2002), and she made a documentary about "Osage Murders" pertaining to the oil leases on the Osage Reservation in the early 1900s, but that doesn't mean she actually had Osage ancestry. 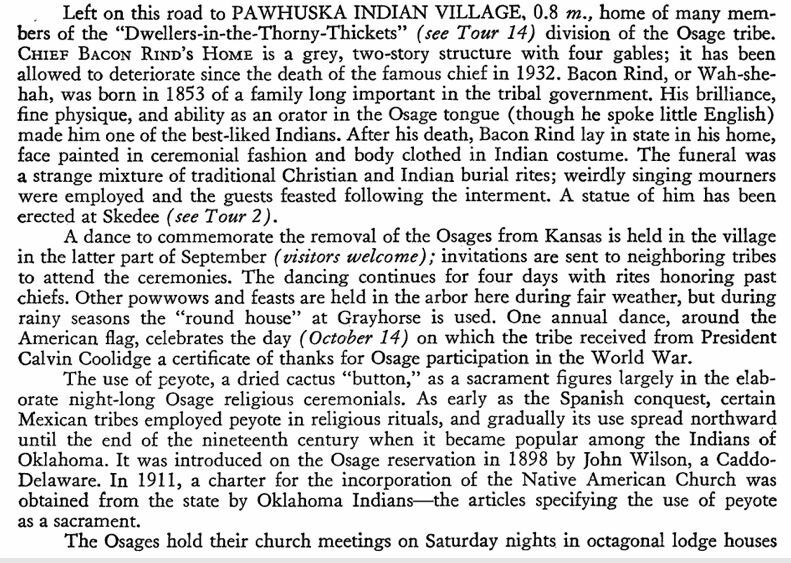 I also have 2001copy of an obituary for Edward William Shangreau of Pawhuska, Oklahoma, the son of Edward Louis Shangreau. It says Edward Louis Shangreau died on March 31, 1982, and I've wondered if there is a connection to Bacon Rind's daughter there. The so-called "unidentified" man in the wedding photo is Judge L.A. Justus, Jr., and at that time he was one of the youngest members of the Oklahoma bar. He was born May 24, 1899, so he was a few days shy of 27 years old when he presided at the wedding. He went on to make judgements in the Osage oil lease scandals. Also of of interest pertaining the oil leases: In 1913, the US Secretery of Interior stripped Bacon Rind of his head-chief title due to a 1906 oil-lease bribery. I call the committee's attention to the treatment the Uncle Sam Oil Co. has received at the hands of the press during this hearing. . . They have circulated the report that Mr. Fisher stated to the committee that Bacon Rind had confessed to receiving a bribe from the Uncle Sam Oil Co., when the statement was that Bacon Rind had confessed to receiving a bribe about seven years before the first negotiations between the Uncle Sam Oil Co. and the Osage Indians for this lease, and that the proposition upon which he confessed to taking a bribe had nothing whatever to do with the negotiations for the Uncle Sam Oil Co. lease. In fact, it occurred, as I recall it, before the organization of the Uncle Sam Oil Co. . . Glenn, the fellow who was indicted for the bribery, was a dummy for the Standard Oil Co. Now, the press connects the bribery committed by a dummy of the Standard Oil Co. before our company was organized, . . The Interior Department since 1906 has known that the 800,000 acres comprising the west portion of the reservation was rich in oil and gas, but it has made no honest effort to lease the tract for any honest development during all that time. Some suggestion has been made that for a part of that time the Indians themselves requested that no leases be made for fear that a large supply of oil would be developed and thrown upon the market and the market price be so reduced that the royalty would not be of benefit to the Indian tribe. . . It is charged in the statement that the Commissioner of Indian Affairs Abbott visited the tribe of Indians in company with a representative of a Standard Oil newspaper, took said Standard Oil spy into the secret councils of the Osage Indians and opposed the making of the lease to the Uncle Sam Oil Co. Mr. Abbott was before the committee, active in making defense to these charges and yet did not dare deny that he took this Standard Oil spy with him on a mission to the Indian council in secret and opposed the making of the lease to the Uncle Sam Oil Co. In another item of interest is Bacon Rind's claim that half of Pawhuska's residents were lawyers "trying to get money from the Indians. If an Indian dies, they go and make a law suit, or an Indian makes a will giving the money to another one and they kill the Indian about a week afterwards."